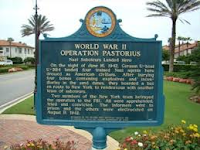 Ruth Brown (Linda’s fictional character) here reporting on the doomed German spy mission Operation Pastorius. Staged in 1942 and named for the leader of the first German settlement in America, the objective was to sabotage the economic infrastructure of the United States. Eight men were involved, two of whom were American citizens. 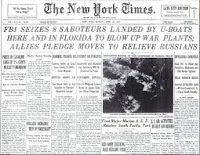 On June 13th, four of the agents landed on the beach in Long Island from a submarine. They wore German uniforms so that if captured, they would be treated as POWs rather than spies. Carrying explosives their aim was to attack a number of locations such as the hydrroelectric plants at Niagara Falls, several of ALCOA’s manufacturing plants, locks on the Ohio River, and the Pennsylvania Railroad’s repair shops at Altoona. They were also to blow up bridges, railroad stations, water facilities and other public locations. On June 17th, the additional agents landed in Ponta Verde Beach, Florida. By June 27th, all eight men were in custody without having performed on act of sabotage. So, what happened? As it turned out, the mission didn’t have much chance of success to begin with. One of the men got drunk in Paris and announced to the plan to everyone in the bar. Another left documents relating to the mission on a train. And yet another of the men, George Dasch, was found by the Coast Guard almost immediately upon landing in New York, but he managed to elude capture. Realizing that failure was imminent, Dasch decided to turn himself in and betray the others. The agents were picked up within a days and tried before a military tribunal shortly thereafter. All were found guilty, six of whom received the death penalty. 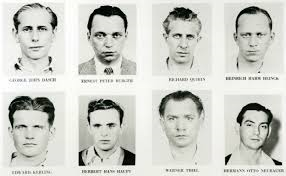 Of the other two men, Ernst Burger received life imprisonment and Dasch thirty years. In April 1948, President Truman granted executive clemency to the two men on condition of deportation. They were transported to the American Zone of Germany, the unexecuted portions of the sentences were suspended upon such conditions with respect to travel, employment, political, and other activities as the Theatre commander might require, and they were freed. Resettled in Germany, Dasch died in 1988 at the age of 92, and Burger in 1975.